Barnes and Noble's Simple Touch Nook is not a reinvention of the e-reader in any way. It's a refinement, and a very good one at that. Why It Matters: The Nook dispels the notion that all e-readers have to be long and slim like a tall novel, opting for a squatter, bulkier body that's a full ounce lighter than the Amazon Kindle 3. It runs Android, but you'll never notice. It's not a do-everything device. The battery's rated for two months of use between charges. (Obviously, I didn't test that completely.) And it uses a new proprietary screen technology that refreshes pages faster, with less flashing. Using It: The Simple Touch feels like it was designed to stay out of your way. When you pick the Nook up, the first thing to grab your attention is the rubberized, carved-out backing that gives your fingers something to grab onto. The feeling's akin to folding a magazine back on itself. And despite the shorter body, the screen is the same 6-inch Pearl e-Ink display as the Kindle 3, so the text is plenty big, sharp and contrasty. Also, the Nook is light. It feels more or less like a small book. Even after an hour of reading, you'll hardly feel fatigued or bothered having this thing in your hand. There are a myriad options for navigating. A handy center button always puts you a click and a tap away from your library or the Nook store. While reading, you can use the touchscreen (which is powered by a similar IR ring technology as the touch Kobo) to swipe and tap through menus and pages. Alternately, you can use the buttons on either side of the bezel to move through content. People with smaller hands might find one-handed page turning to be a challenge, but for the most part, either method is equally convenient. Like: The battery. Barnes and Noble says that if you use the Nook for 30-60 minutes a day, read a page a minute, and leave the wi-fi off, the battery will last two months. Recharge time takes 3 hours. What that means is that the battery is never really a concern. And when you notice it getting low, you probably still have a week's worth of life in it. Page refreshing on the Simple Touch is certainly faster than the Kindle 3. For actual reading it's more or less negligible that the Nook display refreshes a hair faster and only flashes after 5 or 6 page turns. But only when you start scrolling through pages en masse do you appreciate the faster refresh times, which allow you to flip through a book like its nothing. The wider, thicker, lighter body of the Nook provides more room for your thumb and the base of your hand to rest along the front bezel without blocking the screen. There's also no hardware keyboard taking up weight and space. No Like: The Nook touchscreen functions as well as this IR technology ever will (which is to say it will never supplant capacitive touchpanels). But between the IR touch tech and the page refresh there's a slight hiccup in the time between your tap and the actual action being carried out. Once you learn to trust that the Simple Touch registered your tap, things feel smoother, but still, there's an overall disconnected feeling. When you get into more advanced actions, such as highlighting text, things get imprecise and frustrating. Furthermore, the screen is semi-glossy; so if you're reading under direct sunlight, it will reflect off the screen and block out the text. But it's hardly the only e-ink reader with that problem. Should I Buy It: Absolutely. 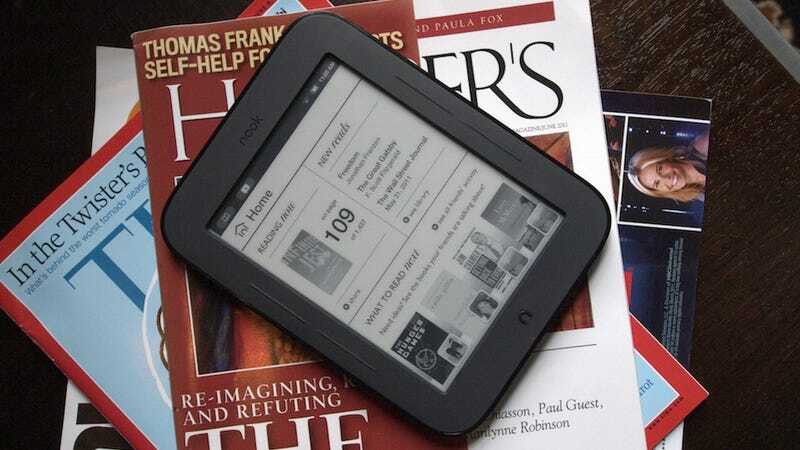 If you're looking for a no-nonsense e-reader that's easy to use, connects to an online book store, handles your side-loaded content (like PDFs), lets you interact with other friends who use the Nook store, and rarely has to be charged up, you will love the Simple Touch Nook. The form, design and guts are superior to the Kindle 3. The offerings from the Nook and Kindle stores are more or less the same, with a small handful of exclusive content from magazines and journals. But each store offers roughly a million books in their store, along with another million books that are free in the public domain. So you don't really lose either way.